There were practically no surprises in the matches where opponents were divided by a rating chasm of several hundred points. Favorites (Ju Wenjun, Koneru, Lagno, Kosteniuk, the Muzychuk sisters, Tan Zhongyi, Dzagnidze, Goryachkina, Gunina) confidently proved their superiority in one way or another, though not all their matches were perfect. For example, Goryachkina’s performance with White had been rather unstable, but on the next day, she was “calling all the shots”; as for Gunina, it seemed that, after interesting events in the end of the first game, she did not intend to play for a win in the second one. In the roughly equal ending, Black periodically managed to set certain problems for her opponent, but now White seems safe, even in spite of being a pawn down. 42.Ke3. Retreat to the first rank looks better. 42…Nb6! If42…Rxh2 43.Rxg6+ and 44.Be7, then Black would be unable to activate his knight. 43.Rxg6+ Kd5 44.Rg8?? The Peruvian player parried the threat of 44…Nc4+ 45.Kd3 Rf2, but overlooked another idea. After either 44.Rg7 or 44.Rf6, White would have every reason to hope for a draw because of lack of material on the board. 44…Kc4! There is a threat of mate 45…Nd5#, and the only way to prevent it is to give up a rook for a knight because the с8-square is inaccessible for this piece. The only sensation in this group was Paehtz losing to Alinasab from Iran. With White, the German player obtained spatial advantage and sacrificed a pawn, but was too slow with decisive actions. 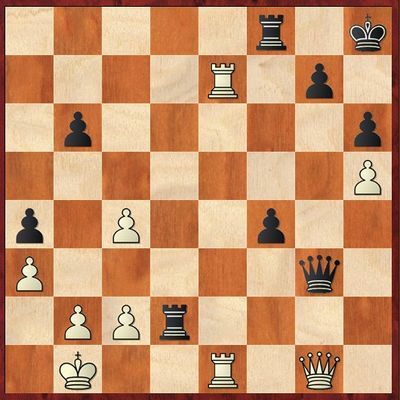 The advantage moved to Alinasab who won the game in the end, though in the rook ending that some years before would be defined as “theoretically relevant” (6- and 7-piece chessbases offer precise answers to every question now), White could have escaped with precise play. In the second game, Paehtz had given up material for the initiative once again, but her handling of the latter was far from perfect. The only reason for Alinasab failing to whitewash the opponent was the Iranian’s slipshod play. The outcomes of three more matches can be formally considered surprising, but since Hou Yifan’s debut in the World Championships, it has been generally known that young Chinese players are liable to pull anything out of the hat. In the first game, 16-years-old Zhu Jineer had outplayed her highly-experienced opponent Javakhishvili in complicated struggle rich with tactical nuances; in their second duel, the Chinese player stood worse in the ending but managed to exploit her opponent’s inaccuracy and equalized with active play. Having gained an advantage later in the game, Zhu Jineer rejected possible repetition of moves and made the best of her chance accurately. The score of the match Zhai Mo vs. Girya was also clean. The rating difference of more than a hundred points must not hide the fact that the Chinese player is a winner of the last Olympiad. The beginning of the first game was favorable for the Russian, but a slight snag in the development of her attack was enough for White to block the access to his king’s position. Compensation for a pawn evaporated, Zhai started massive storm on the kingside and magnified her material advantage. In the second game, Girya was unable to create serious challenges for her opponent and then missed a nice little tactical blow in time-trouble. 37.f4? Rxa7 38.Rxa7 Ng4! 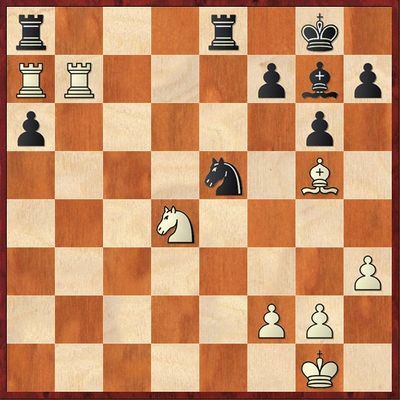 There are threats of both mate on е1 and check on d4; the move 39.Nc2 Bd4+! cannot solve the problem. White resigned. Kashlinskaya’s supporters hoped for continuation of her winning streak that had started on the Isle of Man; however, in the first game she made three bad moves in a row in the time-trouble fever. After 38…Qxg1 39.Rxg1 f3, Black might win as self-suggesting 40.Rgxg7 is elegantly refuted with 40…Rg2!, and, after either 41.Rgf7 Kg8! or 41.Ref7 f2!, White would have to give up the rook for the passed f-pawn. 38…Rg2? 39.Qxb6 f3 40.Re8 Qf4?The only way to avoid immediate defeat is 40…Kh7. 41.Qd8. Black resigned in view of 41…Kg8 42.Rxf8+ Qxf8 43.Re8. In the second game, the Uzbek player managed to hold a slightly worse ending with confidence. Zhao Xue had never encountered any serious resistance in her first game against Lujan and, by confidently controlling the course of events in the second one, managed to seal her success. The struggle in the first games of matches Pogonina vs. Kulkarni and Batsiashvili vs. Arakhamia-Grant was hard enough, but Black’s errors before the time-control resulted in their losses. Opponents gave them no chances to equalize on the next day. Playing with Black against Ushenina, Mkrtchian failed to emerge from the opening. In the second game, it was already former World Champion’s play in the opening that was far from exemplary. As a result, she had nearly lost her queen but managed to minimize losses and hold her own in a pawn-down ending. Socko won her first game against Shvayger with Black after the latter had given up the central file on her own free will. In the second duel, the Israeli player managed to create an unpleasant tension in the neighborhood of the enemy king’s residence, but her Polish opponent launched an energetic counterattack and forced a draw. The story of those matches was merged into one section because in both cases winners managed to gain their desired perpetual checks by sacrificing their rooks. Khotenashvili and Zawadzka moved on to the second round after winning their second games with White. The Polish player had no problems in her first game against Guseva. On the next day, she turned out to be more enterprising in the opposite castled position and created decisive mating threats after queens had already been exchanged. Actually, she did mated her opponent. Vo from Vietnam had an advantage against Khotenashvili but was not sufficiently energetic. The Georgian’s win in the second game can be described as difficult but well-deserved. In 11 matches the “regular time” ended in a draw, and only in one of those an exchange of blows happened: after having lost her first game to Zhukova, Ni Shiqun managed to take revenge with Black. They were also the only pair for whom two 25-minute-long tie-break games were not enough to determine a winner! Harika in her match against Khukhashvili missed quite a good chance to win the second regular game, while in the second rapid one it took a miracle to save her from leaving the championship. 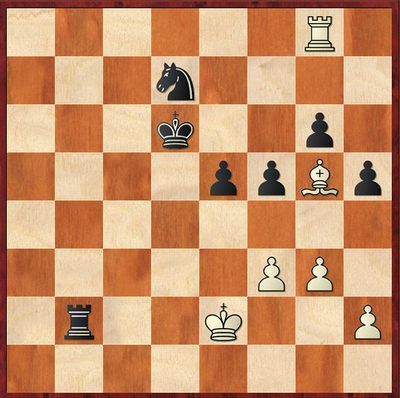 In an equal minor-piece ending, it seemed for a long time that maneuvers occasionally interspersed with pawn exchanges would result in a boring draw. Around move 60 situation sharpened as both sides managed to create passed pawns. 63…Bb2?? Instead of the normal 63…Kc7. 64.Bb7? ?After 64.a6, the pawn becomes unstoppable. 64…Bxd4 65.Nc8+. It was necessary just to eliminate the d5-pawn as after 65.Bxd5 Bxb6?? 66.axb6, the bishop cannot be captured. 65…Kc7 66.a6?? It was time to give up a piece (66.Bxd5 Kxc8 67.Kf3) and to draw thanks to distant pawns. Now Black’s passed pawn becomes powerful at last. 66…Be4 67.Ne7 f3+ 68.Kd2 f2 69.a7 Bxa7. 69…Kxb7 is more natural, 69…f1Q is more vigorous, but the move in the game is quite sufficient. 70.Ba6 Bg2 71.h4 Bc5 72.Ng6. 0-1. The most dramatic episode of tie-breaks, although there certainly were enough slip-ups caused by nervousness. In regular time of confrontations Abdumalik – Padmini, Krush – Gaponenko and Atalik – Cori the struggle was equal. 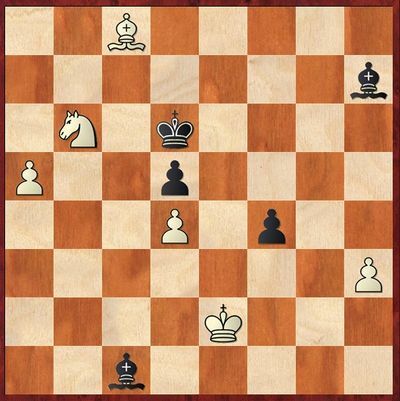 During a tie-break between Abdumalik and Padmini, Black had the initiative. In the first game, the Kazakh player’s resistance was successful, and in the second one she managed to break the opponent’s defense eventually. Krush had won the strategic battle with White, and then made several errors after opening of the center. 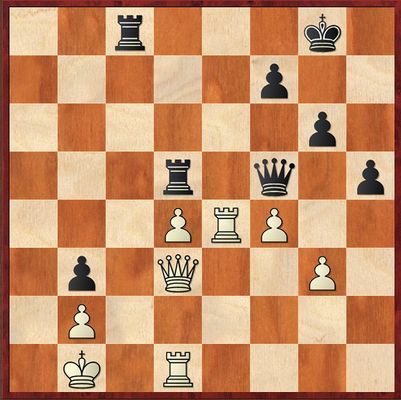 However, Gaponenko, instead of exploiting the open position of white king, transposed into a pawn-down ending. In the second game, she rejected logical repetition of moves, went off on a tangent and lost. Atalik handled the opening with Black rather solidly. Cori had been suffering from her pawn weaknesses throughout the game, so her defeat was generally logical, although she had certain chances for an escape. In the second game White, in a safe pawn-down ending, managed to find a clever plan connected with trapping the enemy knight. The Peruvian did not take into account a simple tactical nuance and gave it up “for free”. All that was left to her after this was to resign. In her first regular game against Foisor, Stefanova, who was a pawn up, played herself into a lost position; and in the second one, she missed her chance to score. During tie-breaks, the former World Champion was much more cool-headed than her opponent. In both cases, the outcome was decided by great material gains. In the match Nakhbayeva vs. Galliamova, Black was looking better in the regular time, so a couple of draws was more or less logical outcome. 35.Rxf7! is worth a Brilliance Prize. If 35…gxf6, then 36.Rxf6 Kg7 37.Rcc6; on 35…Kxf7, there is mate 36.Qd7+ Kxf6 37.Rc6+ Kg5 38.Qg4#. Here it is necessary to see a spectacular refutation of the counterattack (35…Bxf2 36.Rxg7+ Kf8 37.Rc1! Qxc1 38.Rg8+! ), but if you missed it, you can continue, for example, 35.Qd7 Rf8 36.Qd6! with the idea of 36…Bxf2? 37.Qxf8+! But White plays35.Qxg6? ?, hoping for 35…fxg6 36.Rxg7+ Kf8 37.Rcc7 and forgetting about 35…Qxg6. In the second game, the Kazakh player chose a passive scheme aimed at avoiding quick exchanges. Her plan did work out, but only in part. After opening of the game, White threw away a considerable part of his advantage, but the fact that the outcome of the match would be favorable for Galliamova was never put in doubt. In her first game against Saduakassova, Matnadze missed a beautiful winning chance with Black. In the text there was 34…Ra8 35.Re5 Rda5 36.Rxa5 Qxa5 37.Qxb3 Qa1+ 38.Kc2 Rc8+ 39.Kd2 Qa5+ 40.Ke3. White’s position remains dangerous, but, thanks to the opponent’s inaccuracies, Saduakassova soon managed to advance her pawn to d7, thus neutralizing the black rook and drawing the game. After 34…Ra5!, there is a threat of35…Ra1+! 36.Kxa1 Qa5+ 37.Kb1 Qa2#. The move 35.d5 does not work because of 35…Rca8 36.Kc1 Rxd5! 37.Qxd5 Ra1+, and 35.Re5 is now met with 35…Qxd3+ 36.Rxd3 Ra1+! 37.Kxa1 Rc1#. On the next day, the Spanish player offered a draw on the move 9. In the first rapid game, she let down her guard and lost two pawns in three moves. In the second one, Saduakassova, who played with Black, demonstrated her better knowledge of the opening variation and managed to gain a won position by the move 20 by simply repeating the game Markowski-A.Onischuk (1999). With White, Lei Tingjie had frittered away her enormous advantage against Gara and then threw away the exchange; however, the Hungarian lacked both strength and determination to start playing for win in earnest. After first day’s tribulations, the second game of the match was drawn quickly. In the first 25-min duel, Gara made a standard move in the middle game without considering tactical opportunities of the position. Employing a pin, the Chinese player gave up her two minor pieces for a rook and two pawns with an advantage. In the second game, Lei Tingjie had once again evaluated consequences of a non-equative exchange better and, after gaining two pawns for an exchange, encountered no serious resistance in the endgame. Match Hoang Thanh Trang vs. Danielian was abundant in plot twists that were too complex to be described here in detail. After saving the second regular game by sheer miracle, Hoang played strongly in the first rapid one and won through technique. With White, the Armenian once again had real chance to win around move 30, but her knight was much too late to move to с5. 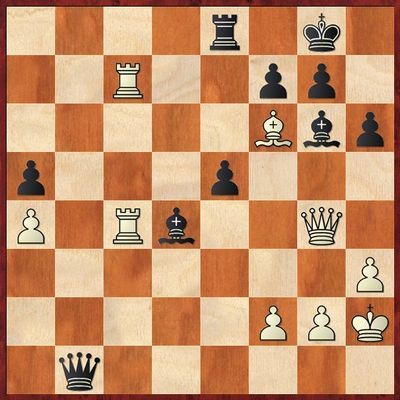 In the first regular game of the Ni Shiqun’s match against Zhukova, the Chinese player had gradually lost the initiative. Black obtained both a better pawn structure and a spatial advantage. Finding herself up against the ropes, White broke under pressure. Exploiting his error, Black executed a maneuver, after which both queens had disappeared from the board, but she immediately gained a brand new one. On the next day, the Ukrainian first agreed to small concessions in the level symmetrical position and then made a sharp erroneous move that led to a loss of an exchange. Ni Shiqun’s handling her material advantage was far from exemplary, and soon White had a chance to establish cooperation of all his forces by activating his knight. Instead, there followed a blunder that doomed that piece. In two 25-minute games, the balance remained undisturbed. In the level ending of first 10-minute one, Zhukova miscasted her pieces and sent her king to the queenside, leaving the opposite flank defenseless. Her opponent created a passed pawn there that decided the outcome. In the last game of the WCh’s first round, queens quickly disappeared from the board, and White drew from the position of strength in a structure with an isolated pawn.